Ratrock’s spring exhibit showcased diverse student artwork, ranging from paintings to photography to poetry. Shards of glass, aluminum foil, and mirrors lie on a table in the center of the room, reflecting light from every angle. What is the message behind this curious arrangement? Face the past in the light of the present. On Thursday Night at the Diana Center, Ratrock’s spring exhibit showcased diverse student artwork, ranging from paintings to photography to poetry. Alongside the art was a musical performance by Elizabeth Bailey, BC ’22, and Colby Lamson-Gordon, BC ’21, as well as DJ sets in collaboration with WBAR. The inspiration for the event was to create a platform for artists to give their own interpretations of “Hindsight.” Some artists interpreted it figuratively, as looking back on past experiences. Meanwhile, other artists took the more literal route, depicting “Hindsight” as a view from behind. Decorative pieces and music accompanied the art in order to emphasize the theme and create an introspective atmosphere. Bailey’s original song, “Man on the Moon,” was a lyrical submission to “Hindsight.” She opted to do a live performance in order to contribute to the exhibit as a social space. “We wanted to create a general air in the room of dissonance and reflection because we wanted to embody the theme of hindsight through all the senses,” Ratrock’s event coordinator Nia Holton-Raphael, BC ’21, said. Holton-Raphael’s artwork took on the theme as a look into the past through changes in an urban environment. 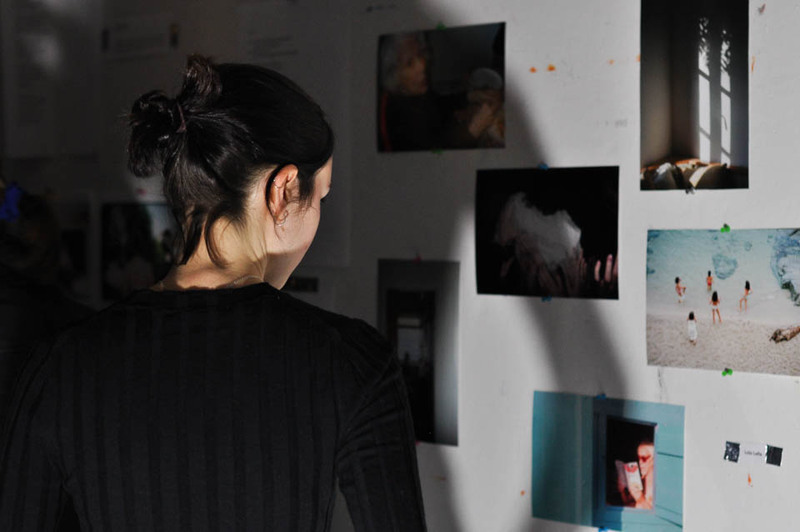 Her submission was a photo essay depicting displacement and gentrification in the Polish community of Greenpoint, Brooklyn. Noelle Penas, BC ’21, stepped back even further in time to embrace the theme “Hindsight,” harking back to prehistoric time. Once the lights in the room were shut off, viewers could see her glow in the dark paintings of wild cats. Artist and Ratrock social media director Eliza Jouin, BC ’21, took the theme more literally and focused her artwork on the body. “I did take it very literally. I did some pieces that show people or statues from behind. These pieces all portray a certain moment that I’m looking back at,” she said describing her photographs at the exhibit. As a magazine, Ratrock’s goal is to be an inclusive platform for student art at Columbia and to foster a sense of solidarity among student artists. “We want artists from all over the school to submit what they’ve been working on because there are so many artists at this school that are not connected and aren’t aware of each other’s work,” Jouin said. Ratrock’s semesterly events, such as “Hindsight,” focus on creating a comfortable and fun space for artists to socialize and, perhaps, even be inspired for future work and collaborations. “So many people that have been featured in Ratrock have ended up becoming friends and collaborating together,” Holton-Raphael said. Staff writer Alexandra Aguirre can be contacted at alexandra.aguirre@columbiaspectator.com. Follow Spectator on Twitter @ColumbiaSpec.